In the ever constant search for something new and exciting in the kitchen, I’ve decided to start making that which I crave from restaurants. 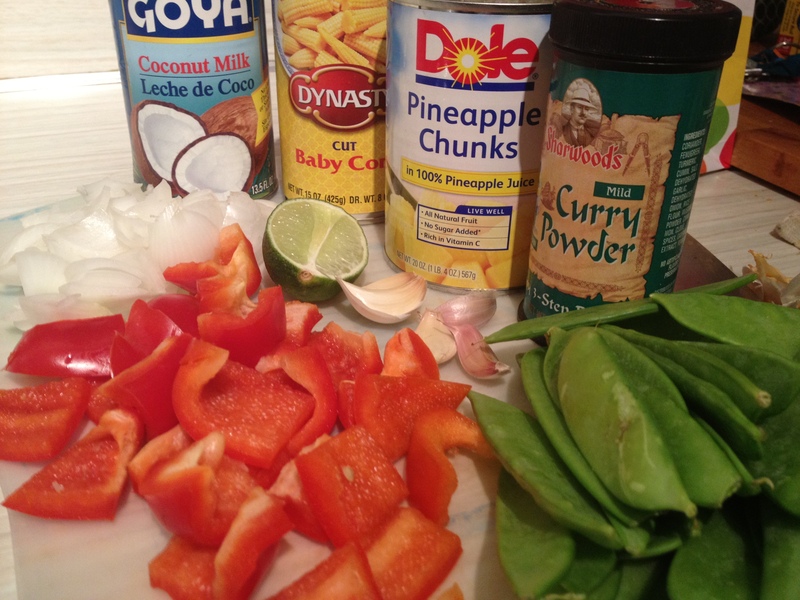 The below recipe is very similar in flavor to P.F.Chang’s/Pei Wei’s Thai Coconut Curry sauce. I made this with a teaspoon of red pepper flakes and a teaspoon of chip oil and the heat is barely noticeable, just a hint, which is nice. And my heat tolerance is not very hot at all. Filled with veggies, lean protein, and quinoa instead of rice, this is a flavorful, healthy dinner that comes together relatively quickly and is super tasty! This makes enough for 4 people. You can also use shrimp instead of chicken for extra awesomeness. Mix the sauce ingredients in a bowl, whisk together, and let sit for flavors to marry. Set it aside. 1 20oz. can pineapple chunks, drained (reserve some liquid for the quinoa if making as below). You want to slice up a pineapple fresh? Go nuts. In a large sauté pan, caramelize or brown the pineapple chunks over medium high heat, about 10-12 minutes. Remove pineapple from pan and set aside in a bowl for later. Add a TBSP vegetable or olive oil in the same pan without cleaning the yummy residue left over from the pineapple. Add the chicken and brown, just cooking through, about 4 minutes per side. Remove chicken from pan and set aside. In the same pan add another TBSP of oil and toss in the onion and red bell pepper. After about 2 minutes, turn the heat down to medium. Place the quinoa and liquids into a sauce pan. Heat to a boil, cover, and then turn the heat down to a simmer and for 10 minutes. Remove from heat and leave covered for an additional 5 minutes. Fluff with a fork and try not to immediately start gorging yourself on this. It’s super tasty, slightly sweet, and a little nutty. The perfect compliment to the Stir Fry. 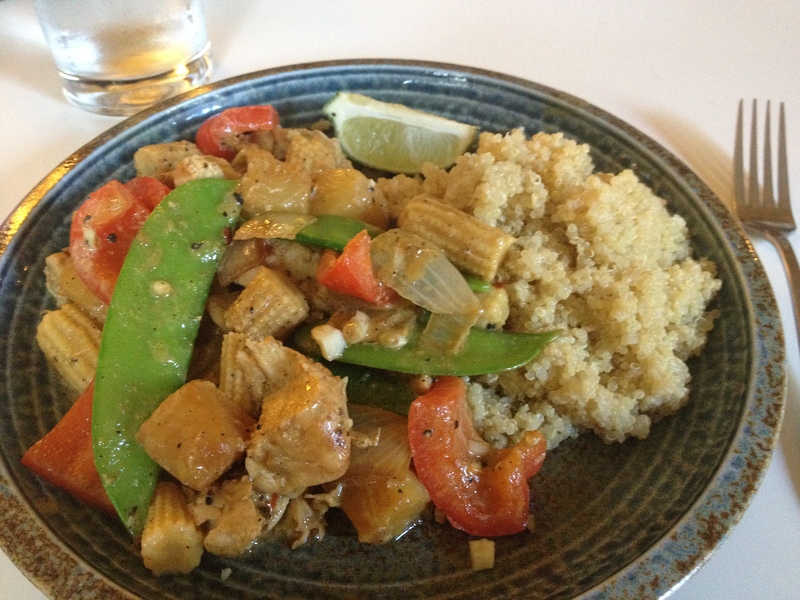 This entry was posted in Entertainment, Geek Chef, Recipes, Uncategorized and tagged chicken, coconut, cooking, curry, diet, dinner, easy, food, foodie, low carb, paleo, party, pineapple, quick, quinoa, recipe, recipes, stir fry, summer, vegetarian.